First published in 1973, this title examines the development patterns of small businesses. It considers why people found firms; the factors that contribute to entrepreneurial success; problems of management succession and inheritance; the strengths and weaknesses of family firms; the reasons why small firms are taken over; and the social, economic and managerial context of their growth, decline, and revival. Based on a survey of sixty-four firms, each employing fewer than five hundred people, in engineering, hosiery, and knitwear, and on the records of 370 similar organisations, a striking gap in performance and management attitudes emerges as between dynamic, mostly founder-run firms and stagnant, mostly inherited ones. 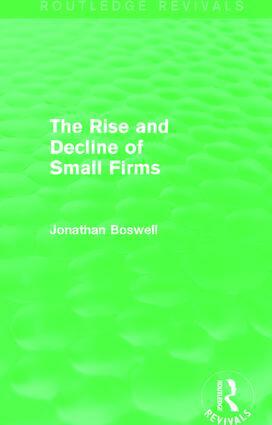 Where many books are either minutely specialised or highly abstract and over-generalised, Jonathan Boswell’s work is practical and diagnostic, probing the inner recesses of the small firm sector. With particular relevance to the difficulties faced by entrepreneurs in today’s economic environment, this title advances selective measures to deal with old firms and inheritance, and a wide range of policies to encourage new entrepreneurship. Why Bother About Small Firms?